The recipe for shrubs—mixtures of fruit, sugar and vinegar—dates back to colonial times. Recently, chefs and bartenders have rediscovered these sweet-sour mixtures and are using them as a base for inventive drinks. Since shrubs are meant to be made ahead, they can be batched and refrigerated for two weeks, a move that eases the preparation of this tart and fruity soda at The Country Cat in Portland, Ore.
1. In clean container with lid, combine raspberries and sugar. Refrigerate mixture until raspberries have broken down. 2. Strain mixture through cheesecloth, pressing out as much liquid as possible. Discard pulp and seeds. 3. For shrub, combine vinegar with strained berry juices; cover and refrigerate for up to two weeks. 4. 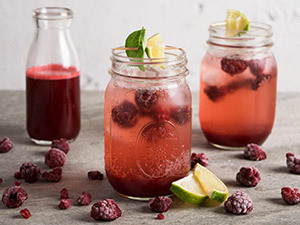 For each serving, fill glass with 1 cup sparkling water; stir in ¼ cup raspberry shrub. Garnish with lime, basil leaves and whole raspberries.